Hello dear readers! I return back to normal life and I return to be here! You have good holidays? you're still on vacation? you go on vacation soon? We begin! Today I will show two more dress combining fabric and crochet... 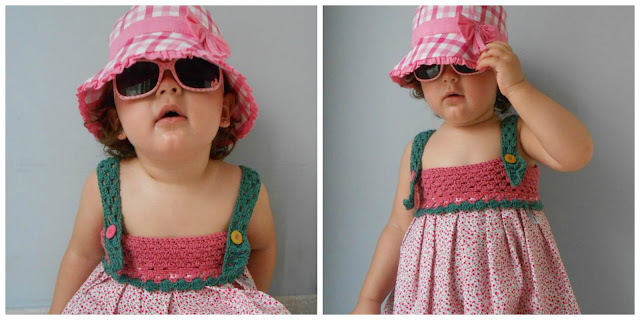 I enjoy the moment I made these two dresses for Carlota ( you can see here ) that I have made two more this summer! Combining fabric and crochet in dresses is a great idea for summer. This model is similar to the previous but has changed the color of the wool and fabric color. I also put two buttons of different colors. 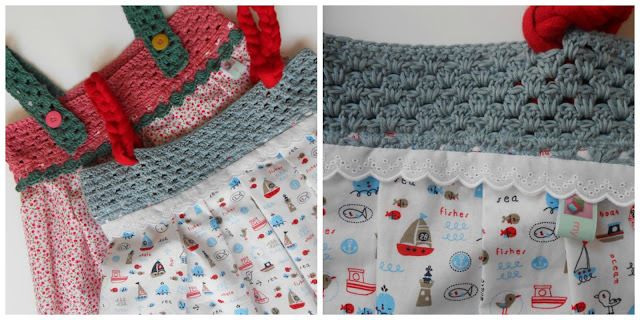 In this one I added a lace tape and I used t-shirt yarn strips, to give a more style sailor like the fabric that I have used. The fabrics are 100% cotton and yarn too. 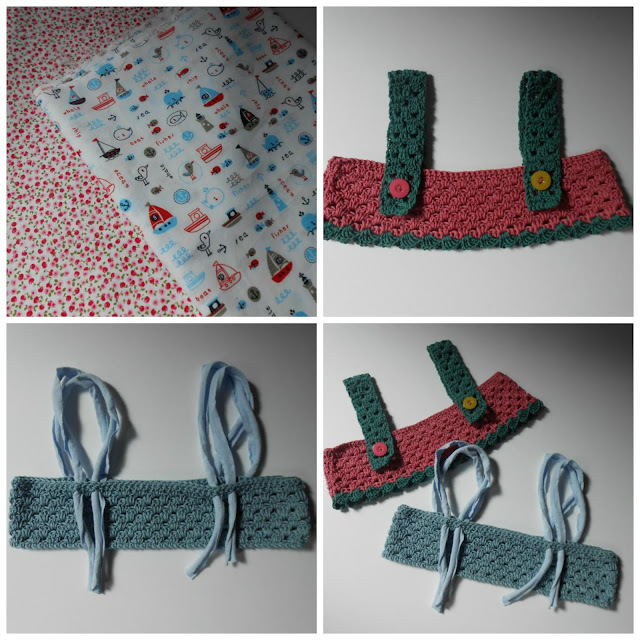 I again used the yarn of the brand DMC model Natura Just Cotton. 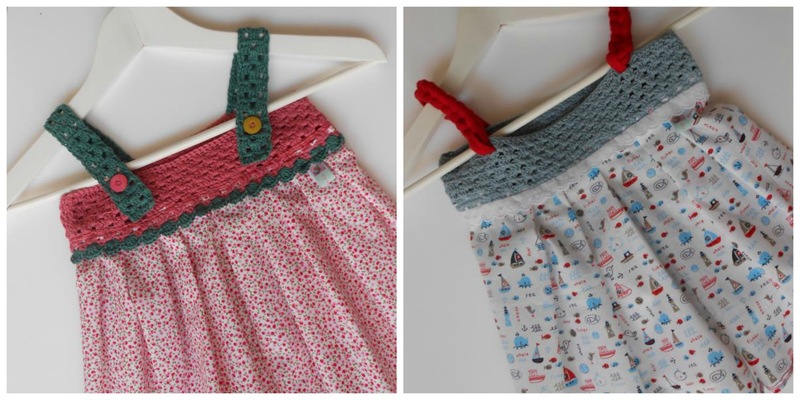 They are very good to make these dresses, softs and sweets! I have worked with 3 mm crochet hook. 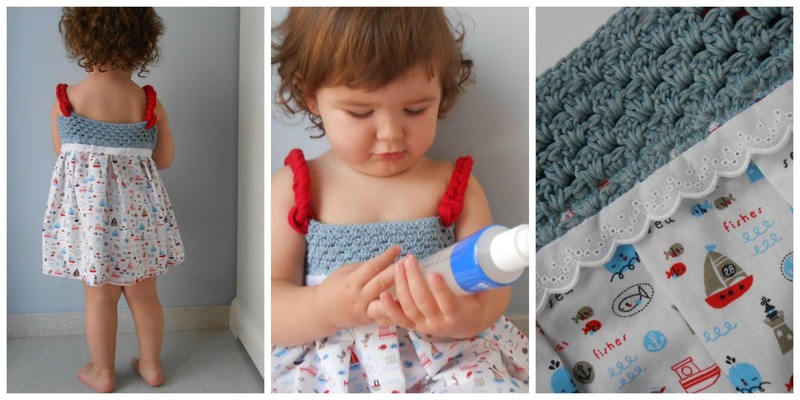 At first I wanted to use blue t-shirt yarn but eventually I figured it best to red colour. It is much cheers, right? The fabric is shorter in this dress and it seems a blouse. I assure you: my daughter was a beautiful girl with a pants of white thread the day she premiered this dress! a lovely set to dress! But the next day he gave me a few precious moments! Thank you for your visits and your kind comments! I want to welcome the new followers of the blog! I wish you you enjoy a happy time in my world of wool! Ualaaaa!! Són una monada de vestidets!!! M'encanten m'encanten Cristina!!! Ambdues teles són una delicia!! Si algun dia tinc una nena en faré un bonica!! Molts petonets!! Jo ja he tornat de les vacances! Quina monada per favor!!!!!!!! Me la menjaria aquesta nena, aixxxxxx!!!! Els vestidets m'encanten Cris, ja ho saps ;) estic en ello!!!! I ja compto els dies que falten per les nostres vacances...petonets guapa!!!! Estás hecha una artista,me encantan esos vestiditos,son sencillos pero hermosos. Son preciosos, y la nena una muñeca. Me encantan e intentaré hacer uno, pero me temo que no soy una artista como tú. Such loveliness, and also the dresses are beautiful. Two years old already-my god, Cristina, how did it happen so quickly to go by ?~! Your creativity combined with her in your pictures makes an award-winning blog for my reading pleasure. Many Many thanks. Happy Autumn. Ei, Cristina! Potser que els hagi vist a Pinterest. Són moníssims. La Carlota està guapíssima! La pena és que la meva Alba ja té 15 anys!! Porta una altra talla!! Jajajaja!! Benvinguda altra vegada a l'activitat. Ànims! Quins vestits més macos i quina model més estilosa!. Aquest estiu ja arribo un poc tard, però l'estiu que ve espero fer-ne qualcun. M'agrada molt el teu bloc i tot el que fas. Enhorabona!! Quins vestidets més bònics, jo en duia de petita, però no eren tan bònics com aquests! La teva filla està guapíssima! Me n'alegro de que ja tornis a ser per aquí i veig que has tornat amb força perquè els vestidets són una monadaaaaaaaa i la Carlota està per menjar-te-la, m'encanta la foto amb el seu barret i les ulleres, quin riure !!! Els trobo una monada aquests vestits combinant tela i ganxet, és increïble com vas aprenent de ràpid. Per cert, et dec un mail (no tinc perdó), a veure si aquesta setmana m'hi poso !!!! 1 abraçada ben forta !! your girl is such a nice model for your creations!!!!! XD!!! La Carlota està per menjar-te-la amb aquests super vestidets!! Quina monada!!!! Tan els vestits com ella!! Comparto en mi face, Gracias!! this is the very uniqueness, i was really not aware d about that. 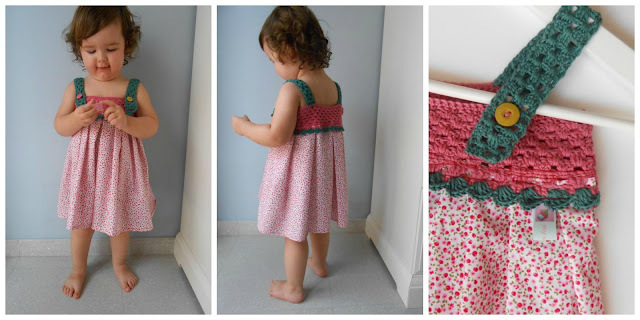 Thanks for sharing this neat idea of combining fabric and yarn, the dress is beautiful and so is your little girl.